We just wanted to let everyone know.... Despite the road closed signs on Center St. from Keystone Ave., you can still get to the Shop and we are very much still open! Aqua has the road closed just past the auto service garage just past our Shop. However, you can not get to the Shop from Pennsylvania Ave. You will have to come in from either Keystone Ave. or come down Franklin St. from Lockhart Ave. I don't know how long the road closed signs will be up. But don't let them scare you off. It's suppose to be a rainy week. 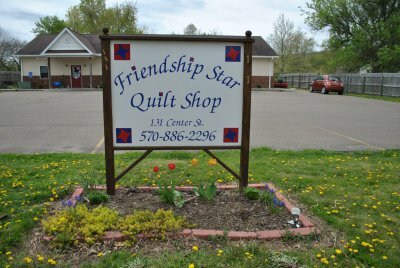 A good week for quilting or maybe doing your own Shop Hop. Mom is getting her Sewing Machine Maintenance class ready. I should be able to get it scheduled and a e-mail out to you on the details.